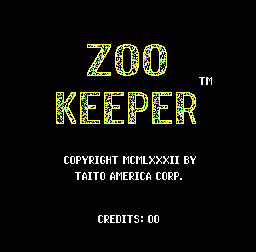 A cult classic, not seen in the arcades by that many people compared to the more popular games, Zookeeper is a three stage game, and each stage has a simple aim. The main stage is where most of the gameplay takes place: you are the zookeeper and it is your job to cage all the animals and keep them inside the cage. . The cage is an area in the centre of the game arena and you build up the walls on the cage by running over them. All the while the animals inside the cage are breaking down the wall. If they escape from the cage they then run around the outside of the cage, and you must avoid them by jumping over them, and then recapture them when the opportunity arises. Higher points are scored for jumping over multiple animals. While you are running around the outside of the animal cage, bonus items appear which can be collected for points, and a net also appears. While you are in possession of the net, you cannot be killed and any animal you come into contact with is returned to the centre of the cage. The net 'power' lasts until the next bonus item appears or until the end of the stage if it is the last item collected. The stage ends when the timer bar located above the gamplay area counts down to zero, and bonus points are awarded for all animals still caged. 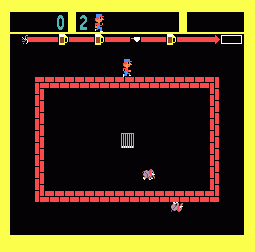 On later levels, the stage begins with a completely open cage, and you must build the cage from scratch, and capture all the animals which escape at the beginning of the round. There is also an intermediate bonus stage where you must jump over animals against moving conveyor belts to reach your trapped girlfriend. If you make it to where she is standing, an extra life is awarded. The second game stage again sees you trying to rescue your trapped girlfriend. This time she is trapped at the top of the screen, held hostage by a monkey(! ), and you must make your way up to her by jumping on the moving platforms, and avoiding the falling coconuts thrown by the monkey. Points are awarded on this stage for collecting the bonus items (fruit, crowns, etc) and for jumping on the platforms. Run into your girlfriend to rescue her. On later levels, the platforms are invisible! Zookeeper is an extremely fast-paced and addictive game. It is very easy to get into, with a few easy stages to get you started, but it soon gets manic, and has you frantically running around and jumping like crazy to catch or avoid the animals. The graphics are very simple and nothing oustanding, but the sounds are completely crazy and compliment the game's frenzied action perfectly. Scoring: Jumping a single animal: 100 points. Jumping 2 animals: 500 points. Jumping 3 animals: 2,000 points. Ending stage with Elephant caged:: 250 points. Ending stage with Snake caged:: 500 points. Ending stage with Camel caged:: 1,000 points. Ending stage with Rhino caged:: 2,000 points. Ending stage with Moose caged:: 4,000 points. Ending stage with Lion caged:: 30,000 points. Points are awarded as above for jumping animals on the extra life bonus stage. Points are awarded on the rescue stage for jumping on the platforms. 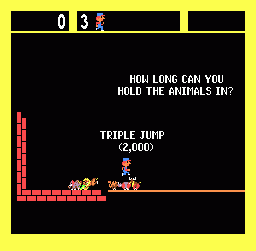 Higher scores are possible for jumping more than 3 animals at once. On the rescue stage, repeatedly jump on and off the top platform. Each time you do this the score increases up to a maximum of 300,000 points per jump, but the longer you do this the more coconuts you have to avoid. On the early stages, try to set up large-scoring jumps over multiple animals. Timing it so they are released close together is tricky, but possible. Note that the higher scoring animals (end of stage) are the faster animals. For example always try to get lions caged as soon as you can, and ensure they are in at the end of the stage. The 30,000 bonus is well worth it. It is apparently possible to score 1,000,000 points with a single jump (or even more), but this has to be classed as extremely rare, and if you manage it, just hope you were recording the game, as everyne who's ever played zookeeper would love to see it!